Malcolm Anderson is a reporter for a Miami newspaper. After eight years, he's had enough of being the newspaper's main guy for covering all the local murders, so he promises his girlfriend that he is quitting so they can move away and get a fresh start. However, before Malcolm can hand in his notice, the murderer from his latest article calls him and states that he's going to kill again. Malcolm is now unfortunately caught up in a brutal serial killer's quest for notoriety and he will soon not just be reporting the story, but becoming part of it seems. 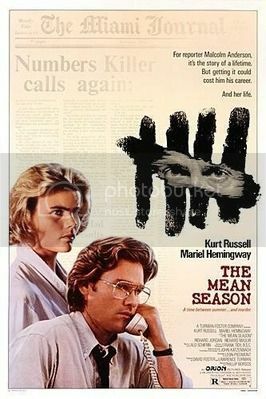 If you've never seen "The Mean Season", I recommend it to Kurt Russell fans. The cast of Kurt Russell, Mariel Hemingway, Richard Masur, Andy Garcia, Joe Pantoliano, Richard Bradford, and Richard Jordan make it worth it alone. The film was named "The Mean Season" after the term of the same name that refers to a pattern of weather that occurs in Florida during the late summer months. Hot mornings with sticky weather leading to violent thunderstorms that blow in from the Caribbean and the Gulf of Mexico in the afternoon. Richard Jordan was just brilliant as the killer. I've seen his role described as menacing and that is quite fitting. I don't wanna give it away, but there is one scene that is just excellent. While the plot is rather predictible to start and slow developing .. however, "The Mean Season" turns into a crazy ride because of the storms and the twist ending. Kurt Russell is great in these kind of roles. "The Mean Season" is a near miss for me. It was based on a book by John Katzenbach, who has had three of his novels developed into movies: "The Mean Season," "Just Cause," and "Hart's War." All three films have good plot hooks but stumble before they are done, winding up as three fair-to-middling thrillers. Stephen King, I think in his book "On Writing," says that Katzenbach has good ideas brought down by poor writing. I haven't read any of Katzenbach's books, but it appears that King is dead on. While I was watching "The Mean Season," I kept thinking how much better the film would have been had Brian DePalma stayed on as director; he was attached to the project at one time. That said, Richard Jordan is excellent as a burnt-out psychopath, and Kurt Russell is, well, likeable Kurt Russell. Mariel Hemingway is along just for decoration. It's an OK time-killer, but it could have been so much more. for me the mean season falls somewhere between being good and great , i feel and agree with you guys that it did have the makings of being a classic but somewhere down the line something went slightly amiss and it ends up falling just short. still a decent thriller that i wouldn't hesitate to recommend to anyone,if i was to score it out of 10 i'd give it a respectable 7,probably even a 8,it's definitely worth a watch. http://www.videodetective.com/movies/the-mean-season/159 - mean season trailer. I have The Mean Season dvd and it´s a good thriller with a cool cast. "The Mean Season" sounds like a great film. Never heard of this before, but anything that came out in the '80's can't be all bad. It sounds like it may have some similarities to the great '91 re-make of "Cape Fear" with DeNiro & Nick Nolte re: the Florida setting & criminal element. Will definitely try to check this out. It's in Florida, and it's a crime thriller like "Cape Fear." And it has some small pretensions to being a "serious" film, also like Scorsese's film. But in the end, "The Mean Season" ends up like a 2 1/2-stars-out-4 B-movie. Yeah It's not a bad little thriller Nostalgic infact it's generally well made with a creepy performance from the late Richard Jordan but for me it's not as fun or as thrilling as something like Scorsese's 1991 Cape Fear remake! I'd definitely recommend checking it out though (I know it had a Blu Ray release the other year) but perhaps not paying top dollar for it and maybe putting it down as one of those to look out for if they ever happen to hit the sales bins! Watched The Mean Season again over the weekend and it's one for me that has definitely improved over the years though it still does have its faults and one thing this time around that bugged the hell out of me was a false jump scare where Mariel Hemingway is in a shower and you can see a shadow of someone approaching from the other side and your obviously meant to be thinking that it could well be the killer but the way that the scene is shot and scored plus the fact that it had already been done to death numerous times before most famously in Hitchcock's classic Psycho that it just came across as feeling a little bit awkward,slightly spoofy infact and sort of out of place with the rest of the film! Acting is really good here and I thought both Kurt Russell and Richard Jordan were excellent,Mariel Hemingway who in reviews I have read tends to get singled out for a lackluster performance I actually thought was pretty decent here and I certainly had no complaints about her performance! Creepy atmosphere here at times as well and I didn't dislike the Lalo Schifrin score https://youtu.be/YpBnlpOaaTc though I have read many people say that they do find the score to be a little bit too overly dramatic for the movie! One other moment that slightly played out a bit too daft for my tastes was when Russell is racing to his wife's elementary school fearing the killer to be there and he jumps the opening (Bascule) bridge,here it is actually someone has posted it on YouTube https://youtu.be/c2tWZFAL5t4 . https://youtu.be/uNpHP81Mv9Y - The Mean Season trailer (1985). Thanks for posting that The Mean Season is on Blu. Never seen the film, but will definitely try to check it out soon. Just recently watched "The Mean Season" for the first time. Excellent thriller, with amazing FL scenery. It was far from a "by the numbers" crime drama, and did have some interesting twists. The villain was especially great, and had very effective disguises. The hurricane weather that hung over the entire film (but didn't affect the storyline too much) was relevant re: this time of year, given all of the storms that have hit the Florida area recently. 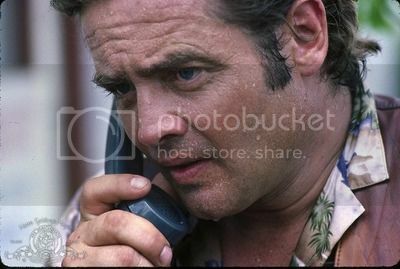 The movie was not at all like "Cape Fear" as I theorized earlier - other than the similar FL setting. Elements of the film reminded me slightly of David Fincher's iconic thriller "Se7en" (1995), without being nearly as disturbing/horrific.